Node-RED is a programming software tool for wiring together hardware devices, APIs and online services in new and interesting ways. Node-RED is a flow-based software development tool developed originally by IBM for wiring together hardware devices, APIs and online services as part of the IoT. Node-RED is a powerful software tool for building IoT applications with a focus on simplifying the ‘wiring together’ of code blocks to carry out tasks. It uses a visual programming approach that allows developers to connect predefined code blocks, known as ‘nodes’, together to perform a task. The connected nodes, usually a combination of input nodes, processing nodes and output nodes, when wired together, make up a ‘flows’. 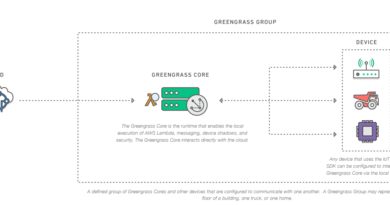 Originally developed as an open source project at IBM in late 2013, to meet their need to quickly connect hardware and devices to web services and other software – as a sort of glue for the IoT – it has quickly evolved to be a general purpose IoT programming tool. Importantly, Node-RED has rapidly developed a significant and growing user base and an active developer community who are contributing new nodes that allow programmers to reuse Node-RED code for a wide variety of tasks. Although Node-RED software tool was originally designed to work with the Internet of Things, i.e. devices that interact and control the real world, as it has evolved, it has become useful for a range of applications. Node-RED is a visual software tool for wiring the Internet of Things, but it can also be used for other types of applications to quickly assemble flows of services. The name is not the most intuitive name. The reason why ‘Node’ is in the name is because the tool is implemented as Node application but from a consumer point of view that’s really only an internal implementation detail. Node-RED is available as open source and has been implemented by the IBM Emerging Technology organization. Node-RED is included in the IBM Bluemix Internet of Things starter application, but you can also deploy it as Node.js application separately. To use Node-RED for Internet of Things scenarios you need to add the Internet of Things Foundation service to your Bluemix application. 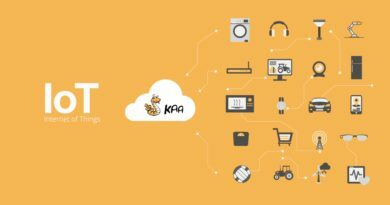 The IoT service allows to register and connect different types of devices. 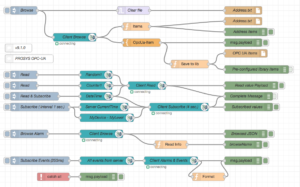 After this you can use the incoming and outgoing MQTT nodes in your flows. Node-RED can not only be used for IoT applications, but it is a generic event-processing engine. For example you can use it to listen to events from http, websockets, tcp, Twitter and more and store this data in databases without having to program much if at all. You can also use it for example to implement simple REST APIs. If you are IoT Developer then you might get multiple questions like, How to manage heterogeneous hardware and software environments? How to stay away from the cloud and use a local server? ​Node-RED provides an elegant solution to merge different IoT devices and services, and stay within a local area network. A project is called a flow, and consists of data and functions linked together. The messages carry data from one node to another. The nodes are functions that generate, transform or use messages. The left pane lists all the nodes, grouped by categories. The centre pane corresponds to the working area, where the flow is going to be designed. The right pane provides useful tools as documentation, a console for debugging, and the organisation for the dashboard. Invented by J. Paul Morrison in the 1970s, flow-based programming is a way of describing an application’s behavior as a network of black-boxes, or “nodes” as they are called in Node-RED. Each node has a well-defined purpose; it is given some data, it does something with that data and then it passes that data on. The network is responsible for the flow of data between the nodes. Node-RED started life in early 2013 as a side-project by Nick O’Leary and Dave Conway-Jones of IBM’s Emerging Technology Services group. What began as a proof-of-concept for visualising and manipulating mappings between MQTT topics, quickly became a much more general tool that could be easily extended in any direction. With over 225,000 modules in Node’s package repository, it is easy to extend the range of palette nodes to add new capabilities. Before you can install Node-RED, you must have a working install of Node.js. We recommend the use of Node.js LTS 8.x. Users of Node.js 6.x and 4.x should ensure they have the latest updates. Node-RED no longer supports Node.js 0.12.x or 0.10.x. Linux and OSX users should install the packaged version of Node.js for your specific operating system, or get the latest Long Term Support (LTS) version from the download site. MeenaG IoT team really like the way Node-RED manages heterogenous hardware and software environments, and offers great flexibility. The same laptop runs the server and displays the dashboard, or separate BeagleBone Green Wireless runs the server and an independent tablet displays the dashboard.